What is it about Hacksaw Ridge’s Desmond Doss that inspired him to be faithful no matter what? How can we instill the same Christian values in our children? Last week I had the privilege of watching Hacksaw Ridge, Mel Gibson’s latest blockbuster production – the true story of Desmond Doss. To me, Doss was a modern day Daniel, Esther or Joseph. What impressed me most was the faith, bravery, character and values of Doss who refused to carry a weapon and kept the Sabbath at all costs (and a vegetarian too). Despite pressure from his training unit he insisted on these ideals and became a hero both on and off the battlefield. He single-handedly lowered 75 injured men off the ridge under heavy enemy fire. You can’t help but be inspired, moved and challenged as you read Hero of Hacksaw Ridge. Order your free copy of the book reviewed in this article – The Hero of Hacksaw Ridge. The opening of Hacksaw Ridge tells us that this film is a true story. And this may arouse some cynicism in people. Some may wonder how much of the story that Hacksaw Ridge tells really is true, and question just how the faith and belief of one man could make such a difference in the world around him. But the story of Private Desmond Doss is true — and it’s even more remarkable for being so. If you want to find out more about the life of Desmond Doss, Hero of Hacksaw Ridge is a great place to start. Hero of Hacksaw Ridge is an abridged version of historian Booton Herndon’s book The Unlikeliest Hero, which is an authorised biography. It shows you much more about the life of Doss than the film does, including many of his heroic acts in saving men injured in battles prior to the assault on Hacksaw Ridge. Hero of Hacksaw Ridge provides some historical detail that gives greater context to the situation Doss finds himself in. This detail aids in further understudying the conditions surrounding being a conscientious objector, including how the Congress of the United States specifically wrote provisions for conscientious objectors to be assigned to medical departments into their military draft law following WWI. Information is also given about Army medical training and exercises. It’s no dry text though — it’s a book you don’t want to put down as you read more about Doss’s life, including childhood experiences, all of which show he was always a caring, giving individual who was deeply concerned with the welfare of others. This carried over into his military training days, where he was actually treated harshly because he was so different and resented for not participating in rifle training. His unpopularity grew over his insistence on keeping the Sabbath, the Seventh-day Adventist Church’s day of worship. There were even threats to kill him in combat. And yet he kept helping, assisting and caring. Over time, this earned him not only respect, but undying loyalty. The chapters on the assault on Hacksaw Ridge, the work Doss did in rescuing so many injured men and his own injuries are excellent and moving, scattered with a mixture of hope and tragedy. Doss is more than deserving of the honours he received for bravery. The full text of the Congressional Medal of Honor citation is included in Hero of Hacksaw Ridge. The Congressional Medal of Honor wasn’t the only award Doss received for his heroic acts — he also received a Bronze Star for valour, the Purple Heart with two Oak Leaves and a number of other medals. In addition to the biography of Desmond Doss, a 32-page exploration of the Seventh-day Adventist faith has been included in the book as a post-script. This is a worthwhile read if you want to find out more about the beliefs that motivated Doss. You can’t help but be inspired as you read Hero of Hacksaw Ridge. In reading this biography of a man who was never satisfied with doing the bare minimum for others, but entirely satisfied with living a modest life for himself, I was moved and challenged. What am I doing to make the world around me a better place? What can I do to help those around me? How are the principles I live by making a difference? 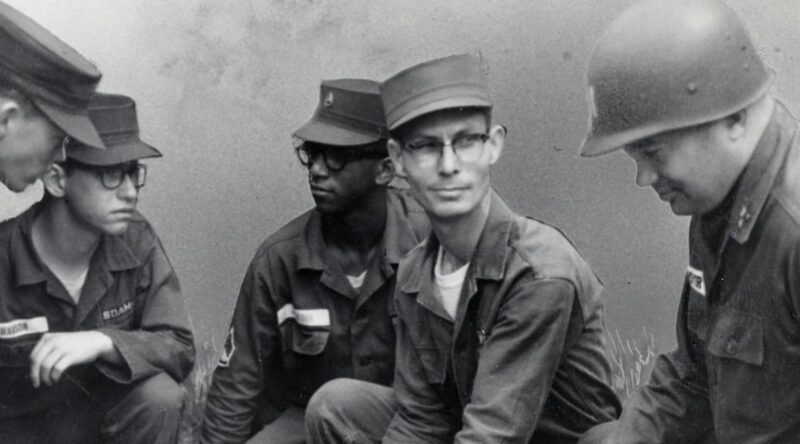 Desmond Doss’ actions at Okinawa and beyond earned him the Congressional Medal of Honor – but what exactly does that mean? Military personnel are the only ones eligible for the Medal of Honor, of which there are three versions — one for the Army, Navy and Air Force. Its history dates back to 1861, with a Navy medal called the “Medal of Valor.” The Army followed this in 1862 with the “Medal of Honor.” There have been more than 3500 Medals of Honor awarded since it was created, and March 25 was designated as “National Medal of Honor Day” in 1990 by the US Congress. You can learn more about this prestigious military award at Wikipedia. The unwavering faith and conviction Desmond demonstrated on the battlefield was not new – he showed those traits his whole life, even in his earliest years. Desmond Doss (7 February, 1919 to 23 March, 2006) was born in Virginia, USA. He grew up with a mother devoted to God and a despondent father devoted to alcohol. It was his mother who fostered Doss’ faith and inspired him to develop his unique identity that set him apart from his peers from an early age. His greatest defining moment was the night his father and uncle were fighting while drunk. Desmond’s father pulled out a gun pointing it at his uncle. His mother bravely stepped between the two, demanding that he hand over the weapon. The confrontation resulted in her securing the gun and passing it to Desmond, who she urged to run and hide it. Following this incident, Doss determined that he would never again hold another gun. This was the background that helped to define Doss’ character inspiring such unwavering faith and conviction. These were the building blocks that would certainly help Doss later withstand intense rejection and ridicule in order to fulfill God’s purpose for his life — a purpose that Doss, himself, could hardly have imagined. For two years, the Army labeled him a worthless liability – but Doss knew otherwise. Doss was assigned to an infantry rifle company. From the very outset, he was alienated and rejected. They believed he was a coward hiding behind the guise of religion to avoid carrying out his duty. Not only did Doss refuse to carry a weapon — he kept the Sabbath and was a vegetarian. His officers and fellow comrades mocked him, making it their personal mission to shame and intimidate Doss into taking up arms. One soldier from the battalion even threatened to shoot Doss if they were ever on the frontlines together. Doss publicly prayed, read his Bible and refused to carry out duties from Friday sunset to Saturday sunset (his Sabbath). He was made to work 24 hours hard labour on a Sunday to make up for it. No-one understood why he kept doing it — not even the Jewish Officer whom he applied to every Friday for a pass. Eventually the Officer threatened to Court Martial him. His captain wanted Doss discharged. He made a blanket rule that everyone in the battalion, regardless of duty, must carry a rifle. Doss refused, saying, “Don’t doubt me because I’ll be right by your side saving life while you take it.” When this attempt failed they tried to discharge him on the grounds of mental instability. Once again, Doss refused to accept the charge. Doss was ever gracious in his quiet strength and determination. He did not blame the men for their constant harassment, but instead served them with dedication and humility. This was shown in 40C° heat during training in the Arizona Desert. Soldiers were dying from dehydration and Doss boldly approached the Commander in an effort to put an end to the inhumane conditions of those who had mistreated him. Doss knew if he compromised just once it would jeopardise his faith. For two years, the Army labeled him a worthless liability. But Doss knew otherwise and, despite their rejection, he kept his eyes firmly fixed on pursuing the plan for which God had called him. For his heroic actions on the battlefield, this conscientious objector received the US Army’s highest honour. Following the battle at Okinawa, Doss was promoted to Corporal. His commanding officer claimed that on 29 April, 1945, Doss had in fact saved 100 lives. But Doss, ever humble, clarified this estimating the number at 50. Doss was the first conscientious objector to ever receive the medal. It was issued in acknowledgement of his “outstanding bravery and unflinching determination in the face of desperately dangerous conditions…” At the ceremony Doss publicly thanked God for giving him the opportunity to save the lives of the men he had served. Doss was awarded many other medals, including two bronze stars for valor. Parades were held in his honour, highways in the United States were named after him, a guesthouse at a Medical Centre in Washington D.C. bears his name, as does a Christian Academy in Virginia. A monument of him stands in the Tennessee Veterans Memorial Park. In 2004, a documentary was made about him entitled The Conscientious Objector. And, more recently, Mel Gibson, acclaimed film director, has produced the film Hacksaw Ridge based on his story. Doss was a corporal who never killed another human being, whose only weapon was his Bible and his faith in God. He was a man whose courage saved many lives and whose contribution to the war was immeasurable. While he was the recipient of many accolades — the accolades themselves were never important. What was important was remaining true to his deep inner convictions — convictions God had placed on him as a young boy growing up.